Bildau & Bussmann was awarded the project of planning and manufacturing windows for the reconstruction of the historical portal facades of Berlin's City Palace. These are box casement windows, with profiles consisting of an exterior and interior window. The exterior of the window meets the requirements of the historic facade, while the interior window is built to meet all insulating and security requirements of a modern building. 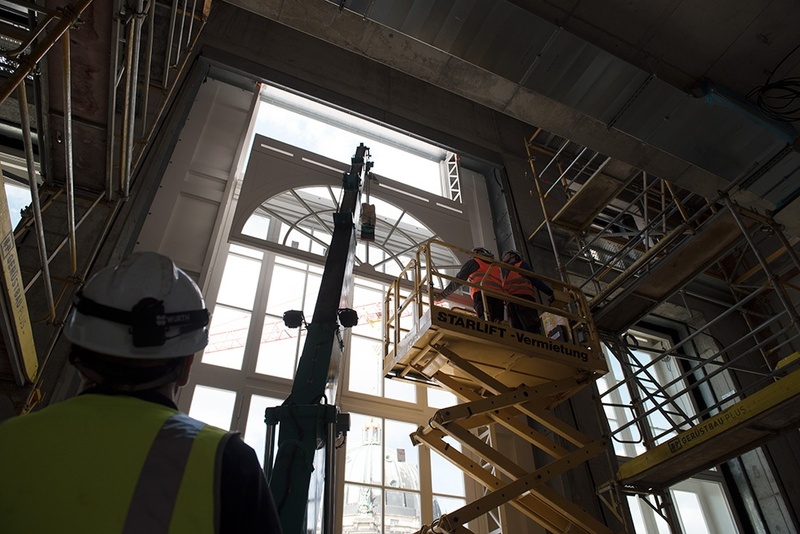 The windows are up to 16' 4" wide and 29' 6" high, with surface areas of up to 484 ft² per element. To withstand the enormous wind loads, structural steel was used to reinforce the windows. Wood profiles were used to conceal the steal reinforcements, to maintain the historical look of the exterior. Up to 2,000 lbs of steel was used to build a single unit. Additionally, Bildau & Bussmann was in charge of the entire production planning and implementation. A team of six engineers worked together on this for over a year. Interested in learning how Bildau & Bussmann windows can cut your energy and fenestration costs?